Hoping to capitalize on the Caped Crusader's rabid fan base, Warner Bros. and DC are planning to release a Collector's Edition of Batman: Arkham City. 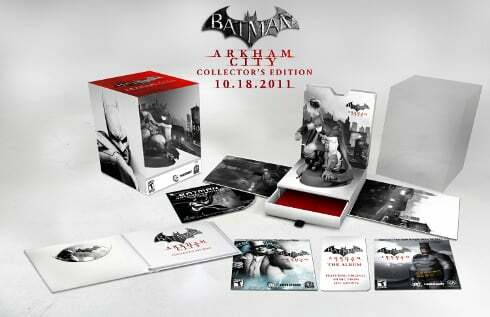 The Arkham City CE will be available beginning October 18th in North America for the Xbox 360, PS3, and PC. Batman: Gotham Knight is a DVD anthology of six animated short films first released in 2008. The shorts take place between the theatrical releases Batman Begins and The Dark Knight. Each film had a different writer. David S. Goyer and Brian Azzarello were among the contributors. The trailer for Gotham Knight is below, along with the picture of the CE's contents. Arkham City is the follow-up to Batman: Arkham Asylum. Now that the Asylum is in ruins, Gotham's most fearsome prisoners have been moved to a walled-off section of the city. Within the so-called "Arkham City," Batman's villains reign supreme. Batman is forced to enter this madhouse in order to rescue Catwoman from Two-Face's clutches.